1. A vehicle with a taxi driver who takes passengers from place to place: Don't wait for a bus, hail a cab. 2. The front part of a large vehicle; for example, a truck, typically enclosed in which the operator or driver sits: The cab of Dylan's truck was air conditioned. 3. Etymology: The term cab is an abbreviation of cabriolet, a light one-horse carriage with two seats. 1. A secret organization or gathering of individuals typically dedicated to changing a government, often by violence: The government was toppled by a cabal of dissident and conspiratorial generals. 2. Intrigues, conspiracies, or plots engaged in by groups or individuals with the goal of getting a new government: The Russian emigres were constantly engaged in anti-soviet cabals. 3. 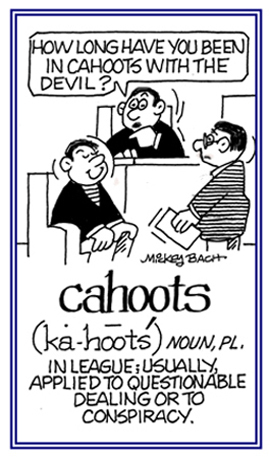 Etymology: from the word cabbala or kabbala, referring to a Jewish tradition of interpreting texts. 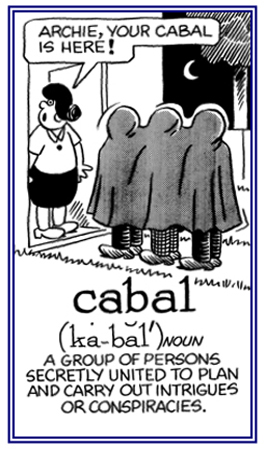 Cabbala is often regarded as "a secret and mystical practice"; therefore, the word took on the additional meaning of "secret behavior". An entertainment site, nightclub, or restaurant, that offers stage entertainment as well as food and drink: Just about every cabaret is full on New Year's Eve. 1. A small, often rough, sometimes primitive living space or accommodation; a log hut: Abraham Lincoln was born in a cabin. 2. The living space or quarters on a ship or boat: The captain's cabin is near the bridge of the ship. 3. 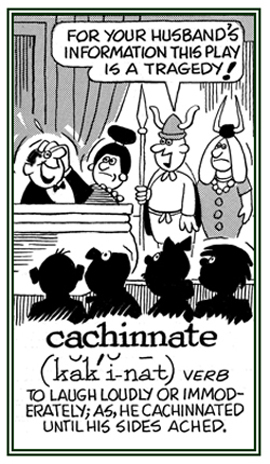 Etymology: from Late Latin capanna, "cabin"; English gets the word cabin and also, via Spanish, cabana; literally, "small cabin", and also "beach cabin" or "small bath house". 1. A collection of selected individuals whose role is to advise or to counsel the head of state of a government: The Secretary of State is an important member of the U.S. federal cabinet. 2. A particular or designated space for the storage or display of objects; such as, a kitchen cupboard: Please put the dishes in the cabinet and don't drop them. 1. The wires used by the telecommunication industry to transmit electronic signals, e.g. telephone, TV, etc. : The telephone company laid their cables under the streets in Jim's neighborhood. 2. A telegram or electronic message sent from one location to another one: Karen was asked to send a cable to the company's overseas office. 1. A hidden repository in which to keep something in a secret manner: The rebels had a cache of firearms in the mountains. Pirates were known to bury their gold in a cache near this area. 2. 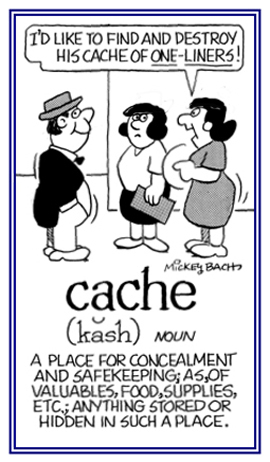 Etymology: from French cacher, "to hide". © ALL rights are reserved. 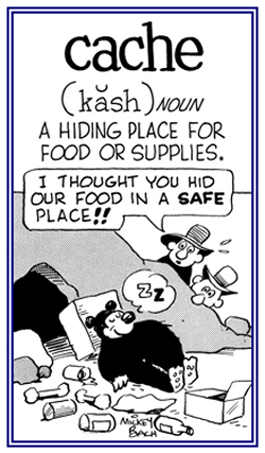 To put something in a storage place; usually, for use in the future: Ted and his family cached extra food and water in the basement in order to have sufficient supplies in case of an emergency. © ALL rights are reserved. 1. To laugh very loudly, hard, or convulsively: While eating dinner with their friends, Seth and Gail, Seth cachinnated so much that Mike's wife and Stan had to make an excuse to go home early because it was just too much to tolerate. There are times when some people cachinnate in an immoderate form of laughter; or excessive, hysterical laughter, because of hysteria or certain kinds of psychoses. 2. 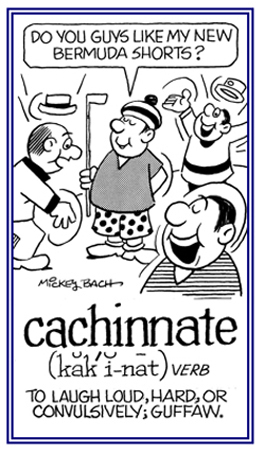 Etymology: from the Latin verb cachinnare, "to laugh loudly". © ALL rights are reserved. 1. Loud, shaking or convulsive laughter: Ivan's cachinnations at public gatherings tend to make people stay away when they know that he will be there, too. 2. 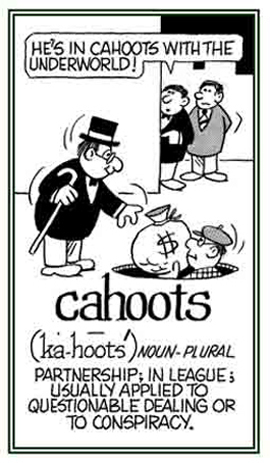 In medicine, excessive, inappropriate, loud laughter without any apparent reason: There are those who have periods of hysterical laughter, known as cachinnation, as a result of schizophrenia, a mental disorder that alters normal perception, language, and communication. A person who laughs loudly and out of control: Dana and Stacy were two of the worst cachinnators known in the group. An ill bred individual, a scoundrel who typically behaves badly towards women: Only a cad would hit a woman. 1. A body without life, a corpse, which may be used for medical purposes or dissections: The cadaver was taken to the morgue until burial was arranged. 2. 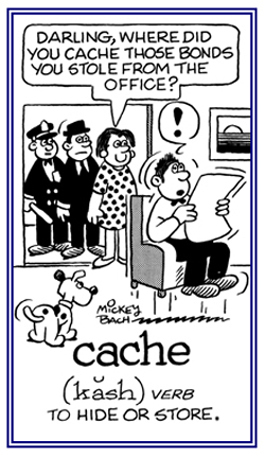 Etymology: the Latin word for "corpse" or "a dead body". Descriptive of something or someone who is pale, emaciated, gaunt, or looking deathlike: Erwin's long illness gave him a cadaverous appearance; however, he is beginning to recover and getting his normal skin color again. An action in which certain people collaborate together and make plans in secret to achieve an illegal act: Jack’s home was burglarized by a thief who was in cahoots with a neighbor. © ALL rights are reserved. Showing page 1 out of 7 pages of 95 main-word entries or main-word-entry groups.